The peacock is the name commonly used for the breed of birds known collectively as peafowl. Originating in the wild, peafowl have been domesticated for thousands of years. Under the right circumstances, they will flourish. But, like any bird in your flock, there may be some times when they become sick. Knowing what to look for and what to do is the key to keeping peacocks successfully. While not technically illnesses, parasites such as lice and mites can affect peacocks' health, even causing death if left untreated. For example, mites feed on the blood of peacocks and can cause anemia, weight loss and weakened immunity. If your peacock has lice or mites, you can treat them with an approved poultry pesticide. Make sure to read the directions for dosage and treatment time. 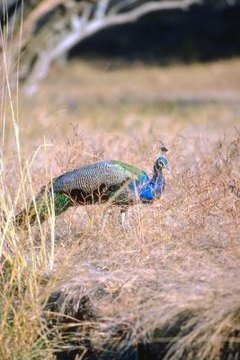 Peacocks can get respiratory diseases such as Newcastle disease or fowl pox that spread rapidly and can’t be treated once the disease has made itself known. Other respiratory illnesses show up as swollen eyes or sinuses. The effects of these diseases can be helped with antibiotics, but they may never go away completely. Keeping your peafowl's housing sanitary and keeping them from sick birds are defenses against respiratory illness. Like many types of poultry, peacocks are susceptible to infestations of worms. The first signs of worms can be weight loss, listlessness and ruffled feathers. Generally speaking, the birds will pick up worms when foraging outside the coop. Because peacocks don’t tolerate confinement well, it’s probably inevitable that your peacock will develop worm infestation at some point. Using a poultry-approved wormer should clear up the situation when it occurs. Young peacocks are susceptible to an infection called coccidiosis, which can cause rapid death by the time symptoms show up. Listlessness, ruffled feathers and bloody diarrhea are often the first symptoms you may notice. Medicated chick feed will contain a small amount of the medicine that helps to prevent coccidiosis but will not prevent it completely. Keep bedding dry and clean as a preventive measure.